Mr. Scalise, 51, has been a fixture in Louisiana Republican politics. He served in the Louisiana State Legislature, where he played baseball in State House and Senate matchups, and was known for pressing hard on legislation that included many conservative bills and a measure to better position the state as a film destination. The State Capitol was where he mastered the art of the personal relationship. 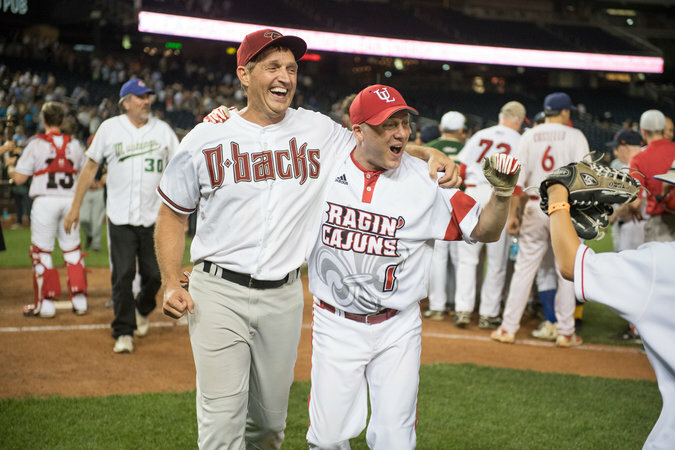 Mr. Scalise, right, and Senator Jeff Flake of Arizona celebrated after the Republican team won the Congressional Baseball Game last June. Mr. Scalise won a special election in 2008 to fill the House seat of Bobby Jindal, who had been elected governor. In Congress, Mr. Scalise quickly and quietly amassed power among a diverse group of House Republicans, in spite of the most conservative wing’s persistent chafing at what it saw as his establishment-wing persona. At the end of 2012, he was elected chairman of the Republican Study Committee, a large group of conservative House Republicans who are generally viewed as more favorable to House leaders than the far smaller House Freedom Caucus. Mr. Scalise used the position as a springboard to become whip, the No. 3 position in the House. Mr. Scalise seemed poised to rise in House leadership after Speaker John A. Boehner announced in 2015 that he would retire, but a bid by Representative Kevin McCarthy of California, the majority leader, to replace Mr. Boehner was scuttled and Mr. Scalise stayed put. He was somewhat hobbled by revelations that year that he had addressed a group of white supremacists affiliated with David Duke in Metairie, La., about a dozen years earlier. Mr. Scalise, who represents one of the most dependably Republican districts in Louisiana, was a reliable critic of President Barack Obama and largely a strong supporter of President Trump, who once recorded a birthday message for one of the congressman’s children. In the 2016 election, Mr. Scalise cruised to victory with 75 percent of the vote in a field of seven candidates. He has been an aggressive voice for the gas and oil industry, typical of a politician of either party from his state, and for sportsmen and small-business owners. His crusade against the Obama-era Dodd-Frank bank regulations endeared him to many in the district like Kellen Picou, whose family owns Mr. Ronnie’s Famous Hot Donuts in Houma. “This is one of the reasons I was following him,” Mr. Picou said. Mr. Scalise, who is married with two children, is big on telling stories and jokes, and he has been known to don a waiter’s jacket and show up at the tables of friends and associates if he learns they are dining in the same restaurant. With much turnover in the Louisiana congressional delegation in recent years, and with a Democratic governor at the helm, Mr. Scalise is widely viewed as his party’s biggest elected star in the state, and a rainmaker for other lawmakers.